Low-dimensional solids are of fundamental interest in materials science due to their anisotropic properties. Written not only for experts in the field, this book explains the important concepts behind their physics and surveys the most interesting one-dimensional systems and discusses their present and emerging applications in molecular scale electronics. The second edition of this successful book has been completely revised to include the remarkable achievements of the last ten years of research and applications. 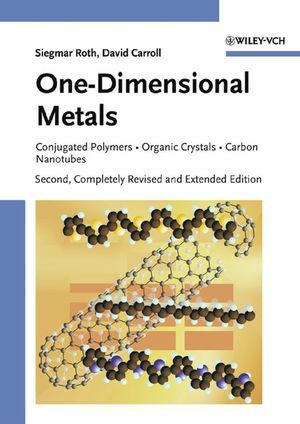 Chemists, polymer and materials scientists as well as students will find this book a very readable introduction to the solid-state physics of electronic materials. After studying physics at the University of Vienna, Siegmar Roth carried out his thesis work at the reactor center in Seibersdorf, Austria, and received his PhD at the Institute of Professor Erich Schmid. From 1968 to 1970 he worked at the Siemens Research Laboratories in Erlangen, Germany, on the solid-state physics of novel semiconductors. After a three-year stay at the High Flux Reactor of the Institute Laue Langevin and four years at the High-Field Magnet Laboratory, both in Grenoble, France, where his research centered on superconductors, he joined the Max-Planck-Institut für Festkörperforschung in Stuttgart, Germany. He is currently head of the Synthetic Nanostructures Group in von Klitzing's department. In addition, he is Senior Visiting Professor at the Shanghai Institute of Technical Physics of the Chinese Academy of Sciences, CEO of Sineurop Nanotech GmbH Stuttgart, and Scientific Advisor to Shanghai Yangtze Nanomaterials. David Carroll carried out his thesis work at Wesleyan University in Middletown, Connecticut, USA, receiving his PhD in 1993. At the University of Pennsylvania in Philadelp hia, his postdoctoral work focused on the application of scanning probes to oxide surfaces. After this, he joined Prof. Rühle's group at the Max-Planck-Institut für Metallforschung in Stuttgart, Germany. For two years there, his work centered on the application of scanning probes to interface studies and supported nanostructures. From Stuttgart, he became an assistant professor at Clemson University, Clemson, South Carolina, USA. Professor Carroll now heads the Nanotechnology group at Wake Forest University in Winston-Salem, North Carolina. 4. Electron-Phonon Coupling, Peierls Transition. 5. Conducting Polymers: Solitons and Polarons. 10. Molecular Materials for Electronics.